During the February 6 Board of Education meeting, the Board voted unanimously to adopt “Level B” of the Alternative Veterans Tax Exemption. The determination was made with input from the public through a survey offered September 24 – October 26, 2018. Property owners in the Troy City School District should speak to their assessor to determine the impact on their tax bill. The exemption will be applied beginning with the July 2019 bill. See figure below. All figures are approximate and based off a property with an assessed value of $100,000. All figures are subject to equalization rates. During the January 16 Public Hearing regarding the Alternative Veterans’ Tax Exemption, Troy CSD Superintendent John Carmello discussed the results of the public survey. 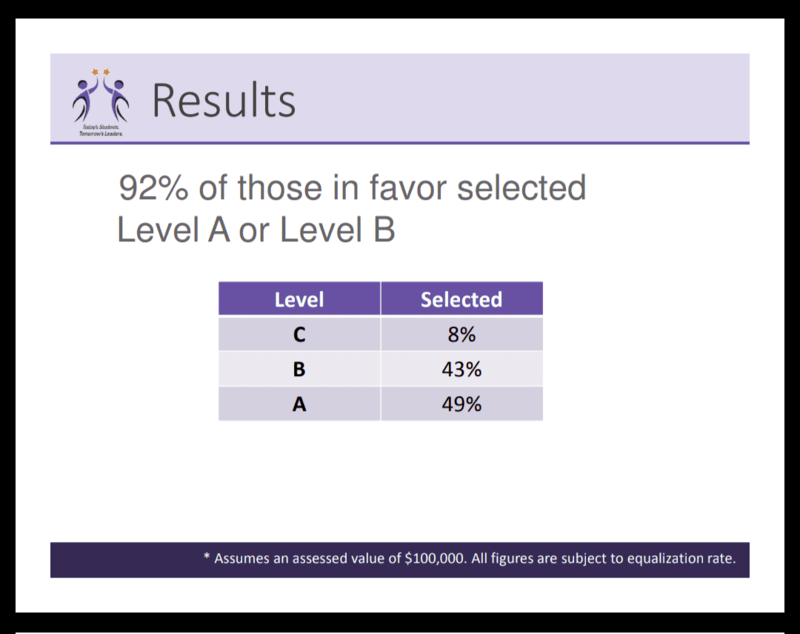 Based on these results, he recommended the Board adopt “Level B” of the exemption. The Board will discuss the results of the survey and make a decision at the next Board meeting scheduled for February 6 at Troy Middle School. The survey was offered September 24 – October 26, 2018 and gained a total of 413 responses. Of those responses, 65.4% said they were in favor of the District offering some level of the exemption, whereas 34.6% said they were opposed. 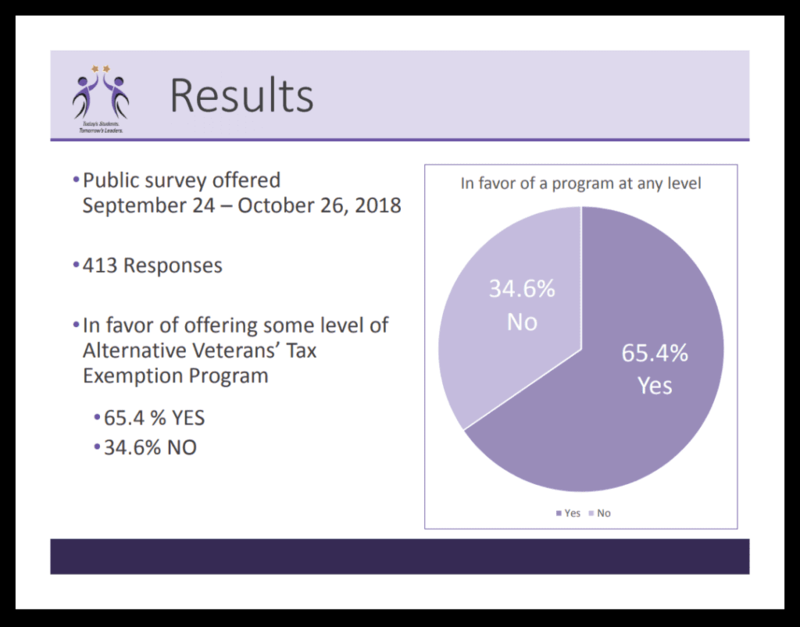 Of those stating they were in favor of offering the exemption, 49.2% support Level A, 42.9% support Level B, and 7.9% support Level C. Also important to note, nearly 60% of respondents’ properties are not eligible for the exemption. View John Carmello’s presentation here. View full results of survey here. The Troy City School District is asking resident taxpayers to attend a public hearing at 6 p.m. on January 16 at School 18 regarding the Alternative Veterans’ Tax Exemption Program. During the hearing, administrators will review the results of the public survey offered September 24 – October 26, 2018. Additionally, residents will have the opportunity to provide public comment. The Board will discuss options but will not make a decision regarding the exemption until the following meeting scheduled for 6:30 p.m. on February 6 at Troy Middle School. The original state exemption allowed municipalities the choice of whether to grant the exemption. 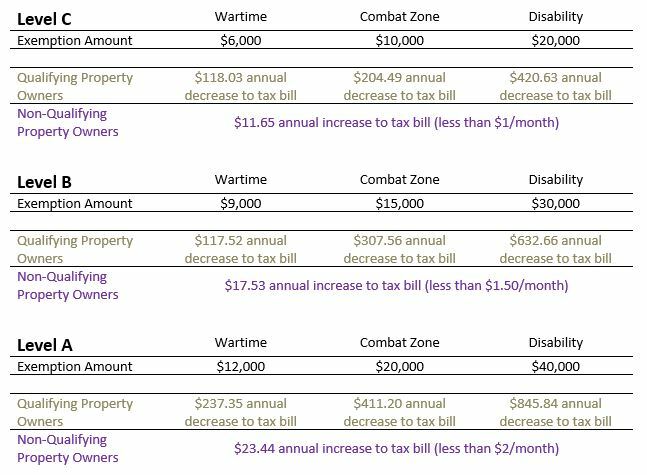 Since then, the law was amended to allow school districts the option of allowing a property tax exemption for military veterans. Unlike the STAR exemptions, Troy CSD is not reimbursed for this exemption by the state, but rather through a redistribution of taxes. If enacted, those who qualify would see their taxes lowered and all others would see their taxes increase. Other Rensselaer County school districts to enact the exemption include Schodack CSD, Averill Park CSD and East Greenbush CSD. If enacted, those who qualify would see their taxes lowered and all others would see their taxes increase. The Board will use the results of the survey to help determine whether or not to allow the exemption. If enacted, they will choose from the options below. All figures are approximate and based off a property with an assessed value of $100,000. All figures are subject to equalization rates. Active duty status during wartime (Persian Gulf Conflict, Vietnam War, Korean War, World War II) for dates specified in law. Veterans receiving Expeditionary Medals or who qualify under the alternatives to “period of war” service may also qualify. Generally, reservists are not eligible. Certain family members of veterans may be eligible. Criteria is service based, not income based like some other exemptions.